This piece started out as a simple review of one piece of software, but as I began writing, I realised it’s one of those times where a bit of storytelling is in order. Some listeners will know that I once had a podcast of my own. Technically, I still do, but it’s a pretty rare release these days. I started right around the same time Allison did but instead of tech, my podcast was about music. I was listening to Adam Curry’s Daily Source Code podcast as he began to imagine the future of music in podcasting. When he set up the Podsafe Music Network and Podshow, I had all I needed to get underway as I reached the “I could do this” point. I hosted on Podshow’s service and sourced all the music I played from the Podsafe Music Network. Importantly, my recording was done with the very simple CastBlaster software, which was commissioned by Podshow. Castblaster followed Adam’s own preferred model of recording – live in one take. A Windows application, it was a player and recorder, with a number of ‘cart slots’ for jingles, more for music tracks, plus basic recording and playback controls. After setting it up, you hit record and could then fire your jingles and music, open and close the microphone, and monitor things as you went. When done recording, it had features to add tags, encode to MP3, and upload to a server. It was a one stop shop, and I loved it. Roll forward 16 months and I ditched my PC for my first Mac. Like many Mac users, I made do with GarageBand. But I necessarily had to completely change how I recorded. I managed to work out a pseudo-live recording process, but it was messy and prone to issues. As a result of these problems, I was constantly on the look out for a better way and eventually came across Übercaster. Übercaster was the best of Castblaster and GarageBand combined. Like Castblaster, it was a true one stop shop for podcast creation and it enabled all the setup ahead of time and “live in one take” recording. But it also had all the power of GarageBand after recording, as it laid down each jingle or song on a separate, editable track. On the odd occasion where I mis-timed a song, or started the wrong one, it was really no problem, as I could just continue recording in the knowledge I could return and edit out the problem later. Recording with Übercaster was pure joy. And then the joy stopped. The developer got really sick right around the time he realised it needed a complete rewrite to work with future versions of OS X. He tried to find a buyer for it but was unsuccessful. A couple of minor updates were released to make it mostly work on newer OS versions, but the writing was on the wall and eventually it stopped working. I’d begun pod-fading while Übercaster was still a going concern, but when I could no longer do my “live in one take” recordings so effortlessly, I rarely had the inclination to record. I managed to put a handful of shows together with GarageBand and later upgraded to Logic. But still the same basic issues persisted. It was too much work to prepare and operate the recording process to maintain the “one take” flow. Sometimes I “cheated” and assembled my pieces to microphone with the songs in a pure editing process, but I didn’t feel right about the result. My life has gone in all sorts of directions in the last 18 months, none of which were inspiring me to record, unless Allison decided to try for a record number of vacations and needed my help. Like now. As life began to settle down a bit, I began hankering, once again, to get behind the microphone. I’d worked out by this stage that I could legally play almost any music and that filled me with all sorts of anticipation. So earlier this year I once again set about searching for software that could give me back my mojo. After a fashion… a rather geeky fashion… I found the answer. But I didn’t find it in a single piece of software, rather a suite of top notch tools that I have working together. I already had most of the parts, but one new application provided the vital missing piece. 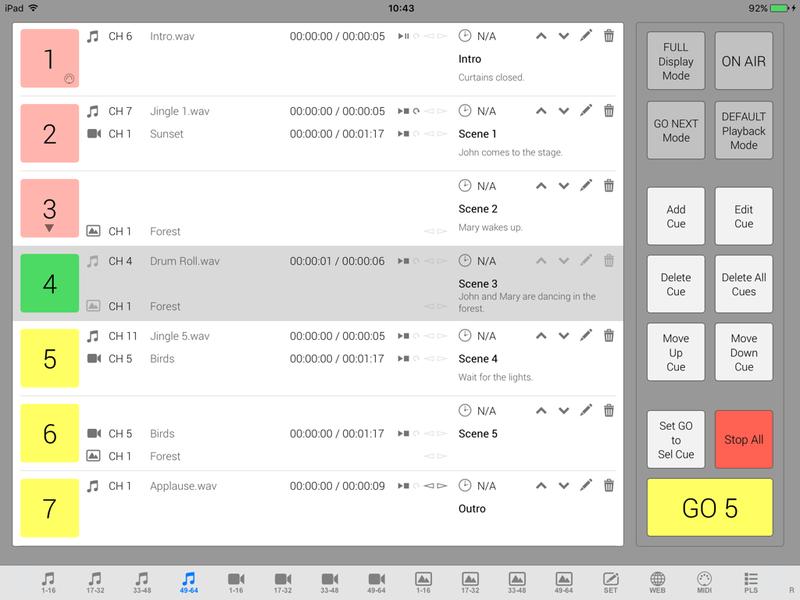 MiX16 PRO from mix16apps.com/… is an application by Gregor Krasevec. Gregor is a professional theatre sound engineer and he created the software to solve his own problems. I have to say he has done a fantastic job with it. Its intended use is to “run” a theatre show, to which end it allows 64 audio files, 64 video files, and 64 images to be set up ahead of time and then “fired” either at random, or according to a prescribed playlist. It has all the controls you’d expect including individual volumes plus master volume, timers for each clip, and more. And it looks great. I trialed a handful of similar apps in my search and every other app was either less capable or less enjoyable to use. Some were also FAR more expensive. One of the key features I needed was the ability to route each audio clip. Some of the other apps enabled each clip to be routed to specific channels of specific audio devices and this is what I thought I needed to achieve true multi-track recording in Logic. Logic can record any number of channels from an audio device. AN audio device. You can only use ONE audio device at a time for input to Logic. MiX16 PRO can output to the default channels of any number of audio devices. Two channels on lots of devices, versus lots of channels on one device. It seemed an impossible ask, but another very clever app came to my rescue. Allison has mentioned Loopback, from Rogue Amoeba, on a previous show. Remember the one where she lost her voice? Loopback is an audio routing tool and with a little thought I realised it could create both of these things and connect them up. I wanted to allow for 8 songs plus a jingles track, plus, of course, my microphone. I created 9 new sound devices in Loopback which are simple “pass through” devices. Each has two channels for stereo sound. I then created a master device with a whole bunch of channels. This is an aggregate device that includes the 9 passthrough devices and my microphone interface. Loopback allows you to set the channel mapping so that each input device’s channel pair maps to a unique channel pair on the aggregate. With that all in place, I select the aggregate device as input in Logic and then create a track assigned to each channel pair. The net effect of all this is I once again have the ability to record “live in one take” and still have a fully editable, multi-track output. The only slight difference from the Übercaster model is that all of the tracks are recording all of the time. In Übercaster the tracks only “recorded” when audio was played for them. But there should be no noise on anything but the microphone track, so trimming won’t be necessary, except perhaps for my sanity if I end up having to do an edit. I will add at this point, that the developer of MiX16 PRO is very responsive. He answered several questions for me before I bought his app. After I bought it, I made three requests for enhancement. He asked me to clarify one then delivered on all three within a week or two. I went back with more later and he has delivered on those, too. Here’s what he wrote to me when I thanked him for the amazing support. User experience and good support is very important to me. My apps would not be as good as they are without users, i carefully read every idea and problem and try to respond as quick as i can. I hate companies which advertise 24 hour response and then you wait for a few days and even then the answer usually is “it can not be done”. Once I got into testing MiX16 PRO, I noticed it had a facility for MIDI control. It could accept MIDI commands to trigger its actions, and could send out MIDI commands as a result of its actions. This got me to thinking. 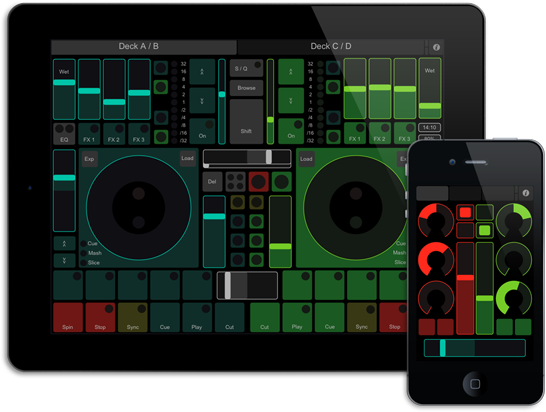 I was sure I’d seen something a long time ago on iOS that could act as a configurable MIDI control surface. You know those cool looking panels with coloured lights you see on some musicians’ desks? After a little searching I found TouchOSC. This app allows for both MIDI and OSC control messages to be sent and received by means of a highly configurable simulated control surface. Unfortunately, you cannot configure the surfaces on iOS – you have to use a Mac. More unfortunately, you have to have Java installed. With the Mac app set up, you can design your control surface quite easily and then have the Mac and iOS apps link up wirelessly (on the same wifi network) to load up the configuration. This whole process is a little esoteric, but not hard if you follow the fairly comprehensive documentation. By trial and error, I was able to tie up the control surface commands with those in MiX16 PRO. During this process the developer once again showed his willingness to support his users. I asked if additional MIDI functions could be supported and also if he could support a whole new mode of operation. Needless to say, after a few clarifications, he delivered all I had asked for, while at the same time making sure his existing users would not be surprised or disadvantaged. I went one step further and configured the control surface to send a command to Logic, too. This one mutes and unmutes the microphone track, so now I have complete control of my recording session from a single screen on my iPad. With all of these pieces in place, recording is once again enjoyable and live in one take. Let’s see if I can pump out some more Sitting Duck Podcasts this year. Links for all of the software mentioned are in the show notes. Allister has an exceptionally fine voice and brings a wry sense of humor to his audios. Obviously he’s serious about this!